Airborne shipping was inspired by two unexpected privatization cases this year (Guohao Group (00053) and Baosheng International (03813)). In recent years, there have been more and more cases of privatization failures, starting from the failure of privatization of ZTE Aluminum (00098) last year, followed by New World China Department Store (00825), New City Development (01030), and Baosheng International (03813). And Guoco Group (00053) at the beginning of last month, among which I have participated in the development of Xingfa Aluminum, New World Department Store and New Town, and Baosheng International and Guohao have a high rate, so I did not participate at that time. After the privatization of the above five companies failed, only the development of the new city could rise on the next day, mainly because the stock price was higher than the privatization price before the vote. The market has unanimously expected the privatization to fail, but the other four companies have their share prices on the next day. It was down. The biggest drop was Baosheng. The stock price fell 37% on the day and closed down 31%, followed by Guohao, which failed privatization at the beginning of last month. The stock price closed down about 24%, and the other two companies fell. It is relatively minor. Why is the decline of Baosheng International and Guohao Group so large? I believe that the biggest reason is that the market is basically unanimously expected to succeed before the two privatizations. This expectation is mainly reflected in the discount rate of the stock price before the voting. Baosheng privatization price of 2.03 yuan, the closing price of the day before the vote is 2 yuan, a discount of only 1.5%; Guohao privatization price of 135 yuan, the previous day closing price of 132 yuan, a discount of only 2.2%, when this discount Below 2-3%, our general expectation is that the privatization “great” opportunity is passed, so once the privatization fails, the stock price usually responds with a big drop. In response to these two cases of privatization failure, I have the idea that before the privatization vote, I will short-sell some of the proposed privatization shares with a small share price discount. Once privatization fails, the stock price will fall sharply; If a privatization is successful, the potential losses are limited. Of course, this idea is limited to stocks privatized by the Scheme of Arrangement; if it is privatization of the offer form, such as New World China (00917) and later New World China Department Store (00825), the offer expires. The risk of front hollowing is extremely high, and I will never take this risk myself. Sinotrans Shipping will vote on the privatization resolution on December 13. The privatization price is 2.7 yuan per share. I myself short-selled at 2.61 yuan per share, which is a 3.3% discount to the privatization price. If the privatization is successful, I lose up to 9 sen or 3.45% per share. If the privatization fails, I believe that the chance of the stock price falling back to 2 yuan is quite high, and the potential return is about 23%. At present, the average P/B ratio of listed peers is 1.03 times, and the median is 0.83 times. However, the privatization price of Sinotrans Shipping is only 0.75 times the price-to-book ratio, which is far lower than the listed peer average, not to mention the assets of Sinotrans Shipping. Up to 1.3 yuan per share in net cash, the financial situation is the best among the listed peers, so this valuation is extremely low! When the privatization was announced at the end of September, I personally felt that the privatization price was not attractive. However, the market sentiment was very poor. Therefore, I still feel that the opportunity is very high. Now that the market conditions have stabilized, the chances of vetoing the price are not low. Of course, as a state-owned enterprise, Sinotrans Shipping may have secretly contacted the friendly vote to support it, so I just went to Bo with a limited number of bets and would not re-note. Investors who share the same ideas with me believe in a lot. My first short-selling was on November 23, then the second short-selling on November 26 and the same day in the afternoon, and the short-selling ratio of the two days rose sharply, but I did not share it with anyone beforehand. My operation, so the short-selling ratio of these two days suddenly increased sharply. It is estimated that many speculators and I have the same idea. It is because the privatization circular was announced on November 20, and there is no need for a true voting date. After waiting for the period, the cost of borrowing for short selling was also determined, so everyone joined in this event-driven short-selling transaction. 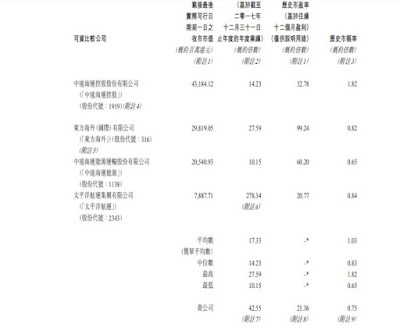 The current share price of Sinotrans Shipping has dropped slightly to 2.55 yuan, that is, if it is only now added to the short-selling, the potential maximum loss is about 6%, while the potential return is only about 21%, and the value rate is slightly lower than before. This entry was posted in Investment and tagged Privatization on 5 December, 2018 by Wai Gor. Xingfa Aluminum (00098) for first quarter operating data is great! Globe Brand (787.HK) — Why is Feng’s reincarnation and potential behind? [Funny] Do not provide any investment advice is correct! Which is the trap for investors this year?